Follow and Support Eddie and his Recovery! A Message from the Ryan Family: Eddie is home and the we would like to send a heartfelt thank you to everyone for their generosity and support! It's me, Angie Ryan, mom of Marine Sgt. Eddie Ryan writing to give a great big thank you for your support and even more, your prayers. Marine Sgt. 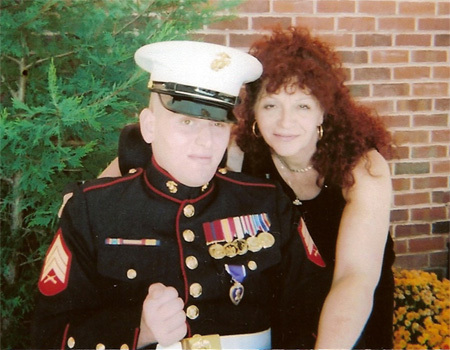 Eddie Ryan with his mom Angie outside of Helen Hayes Hospital after receiving his Purple Heart Medal. Our family has been through a very painful journey, one that is sometimes overwhelming for us, so it becomes difficult for us to do things that otherwise would be easy to do. As I write I feel totally blessed by all the prayers and support that we have and that my friends have been a big part of our strength. We give thanks to our Lord Jesus, who by His love and grace spared our son. Although we have yet a long road ahead, I know that He will see us through, for God does not do things half way. Words cannot express the feeling of gratitude I have for all of you. I am totally moved by it all. It's truly life changing. I don't know how I can thank you all. I think this is one way to express my appreciation - look at where we are ... HOME! How happy are we, especially Eddie, to be home, a place where we are once again a family. Eddie is doing well and we are continuing his therapies at home. He presently attends a Wellness Center in Glens Falls, NY. Day in and day out he strives to be the Eddie he once was and still is, an awesome Marine. Eddie feels the power of love and prayers through the cards, letters, drawings and phone calls, they are like gold to him. People at home and abroad have been most generous. We thank you for your financial support. Throughout the 16 months of hospital and rehabilitation stays, we have also received lots of visits, food and flowers. Let me tell you how encouraging they were. Thank you for your kindness. On Behalf of my son, Sgt. Eddie Ryan, our miracle marine, I thank you with all that is in me. I have spent many many hard long months with my son, but I have to tell you this; when I rise with him each morning and look at him, I can see God's grace and mercy. I thank you Lord for him. I pray that God will bless each and everyone and I promise to keep our marine squared away. I will continue to do my very best to see that he has what he needs to help in his recovery - my absolute love and prayers. Semper Fi, my son, I love you with everything I got! You are a hero, a symbol of faith, courage, honor and bravery. And I thank God for my awesome daughter Felicia and husband Chris, who aside from the Lord, they have been my help, strength and loves. I thank you and love you very much. Articles and some images used within this site were provided by the Times Herald-Record.